You know when you buy chocolate chips for a recipe, (or white chocolate chips or peanut butter morsels) you never need to use the whole bag and the morsels just sit in your kitchen cabinet for ages? Well, that applies to me. I don’t eat much of the morsels straight out of the bag and what is left, doesn’t cover enough for another recipe. 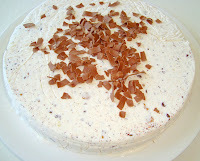 If this sounds familiar, I have the perfect recipe to get rid of all of your morsels: Ice Cream Cake. You can use any type of morsels you like for this recipe, which is great because I had 3 different types of morsel-leftovers. I must say that the recipe calls for a little too much chocolate chips in my opinion. 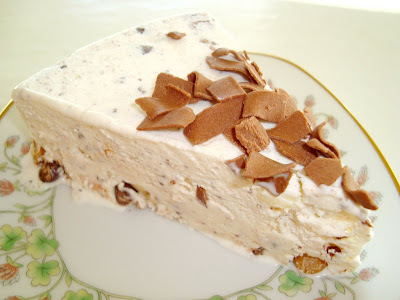 When you stash the cake in the freezer, the morsels become very hard, along with the peanuts, so it’s a little too much to bite in when you’re eating the cake. And I don’t know about you, but I don’t like to bite in ice! Next time when I’m making this cake I might even skip the chocolate chips and use more biscuits. - Let the ice cream soften either in the refrigerator for a while, or out in the kitchen. - Line a 8-inch springform tin with clingwrap, both in the bottom and sides of the tin so that you have some overhang at the top. 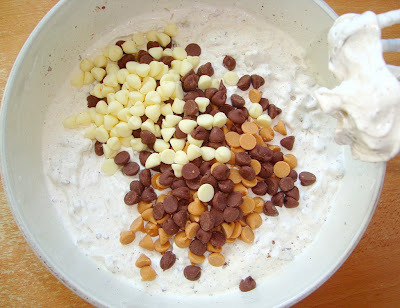 - Empty the slightly softened ice cream into a bowl and mix in the peanuts, chocolate chips, Crunchie shards and chocolate cookie crumbs. 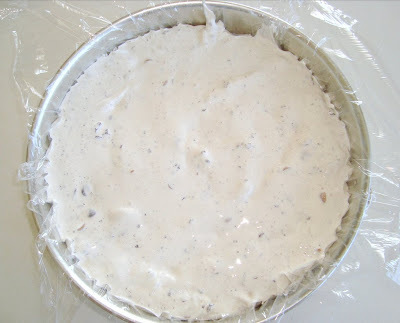 - Serve the cake straight from the freezer, unmould from the tin and pulling the clingwrap gently away before putting on a plate or cake stand. 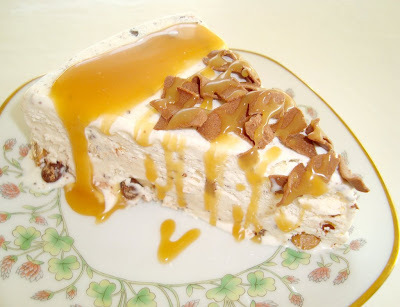 - Cut into slices and serve with the butterscotch, letting both dribble lacily over each slice. My 3 different types of morsel-leftovers. The crushed biscuits along with the ice cream, made it taste exactly like a McFlurry!!! Before stashing the cake in the freezer. The cake is sooo easy to make! Because of the warm weather, I didn’t want to waste time being cooped up in my kitchen the entire afternoon. Everything took me about 20 minutes to make. The freezer does the rest of the work! And the final touch, some home-made butterscotch sauce! This looks like the perfect warm weather recipe. Thanks for posting! Oh gosh that cake looks so delicious! I always think I want ice-cream cake for my birthday, I'll try this recipe when November rolls around! !